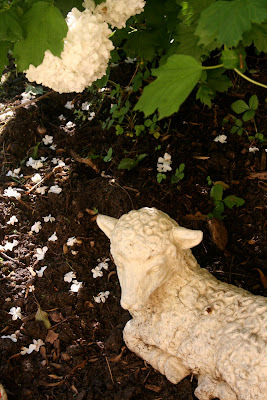 I took a step out into the garden this morning to take stock of what transpired during the night. The garden in spring is just filled with surprise. This Clemantis is always a show stopper. This is it's third year in bloom and it is heavey laden with blossoms this year. There is a Mama Cardinal sitting on a nest just above this birdbath. She has found a place in the red climbing rose that grows next to the Clemantis. I will try to get a picture once the baby is born. She's not happy with my presence, to say the least. This ladder will soon be covered with Sweet Pea vine which is about a foot off the ground today. The plant comes back every year with the most beautiful pink flowers. In the meantime, I can enjoy the Foxglove in all it's glory. My friend, Debbie gave me this lamb for my birthday a couple of years ago and I just love it. It always makes me stop and think of the Lamb of God. 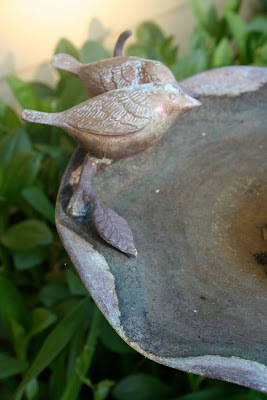 It greets me going in and coming out of the garden, an ever present reminder of the One who created it all. Blessings! I'm waiting for my clematis to bloom. It should any time now. Oh my goodness! You have such pretty flowers. 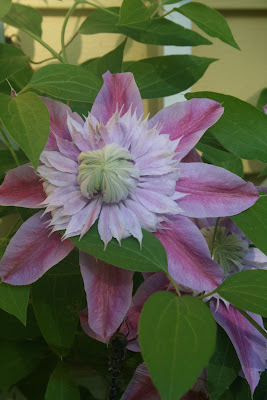 I love clematis plants. 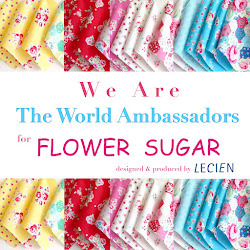 thank you for sharing your wonderful photos. 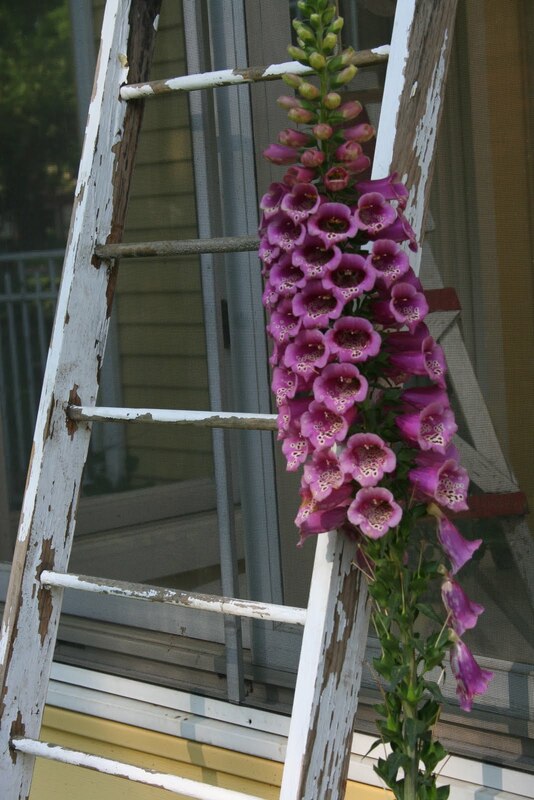 Your clematis and foxglove are gorgeous! God did indeed create a beautiful world! I was so taken by your foxglove, that I purchased one. Now if I can only find a place to put it. The flowers are so lovely, Renee, We live in a townhouse in the city now and I do miss having a flower garden. Thanks for sharing yours. Your flowers are looking so pretty. You are right. That Clematis is a show stopper. Such a sweet color. Your garden is coming along, Renee.Love the ladder too. Seeing your lamb makes me wonder what happened to mine. Hmmm...gonna look for it when I get home. 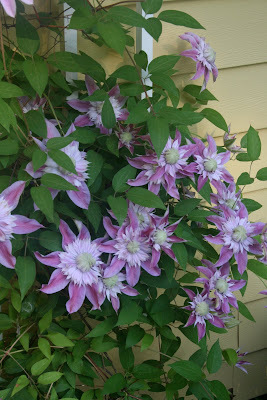 My Mom's Clematis is having a banner year too. Everything looks beautiful, but I can't wait to see the sweet peas! beautiful flowers...love your clematis and that ladder is a fabulous idea for your vine to climb. Have a great week! what a special present...love the lamb! !